There are several different ways to create a homemade journal, ranging from quick and easy methods to advanced book making. Homemade books and journals make fun homemade gift ideas... especially when paired with a coffee gift basket, a hot cocoa mix or one of these cute chai tea mixes. 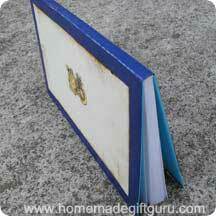 The easiest way to make a journal gift is to embellish a notebook. The notebook is covered inside and out to give a professional finish from front to back. You can then decorate as desired. Scroll down for a couple of these easy homemade journal tutorials. On the other hand, you may want the freedom to choose the type of paper used to fill the journal and perhaps the exact size of the book. In this case you should try binding your own book. You can bind your own book using heavy duty glue, book screws or binding thread... or you can purchase a book binding kit. Garden Notes - Gardeners often keep a notebook for recording information about their garden such as planting dates, varieties planted, sketches of their garden's layout and dates of any treatments of fertilizers, herbicides etc. All this information makes it easy to see what works best and to utilize best methods each year. Idea Book - This is a great way for people to record their inspirations. Perhaps they are starting a new business or they are constantly thinking of new ideas for a favorite craft or hobby. Design the cover with their hobby or business interest in mind. It feels really good to get all your ideas "out of your head" and onto a piece of paper so this theme can be truly a gift. Poetry Book - To record their finished poems or poems in progress. Creative Writing Book - For someone getting into short stories or any creative writing. Song Book - For someone who writes songs or lyrics. Art Journal - Anyone that's into art and crafts of any kind needs a sketch book for their ideas. It doesn't need to be made with fancy paper, any blank paper will be good enough to sketch art ideas. This is great for any artist, potter, ceramicist or crafter to name a few. Quote Book - For someone who likes to collect quotes. Ideas for themed homemade and embellished journals are endless but I hope the above brainstorming helps. Following are some easy embellished notebook journals that you can customize in an endless array of colors, patterns and themes. Here are some homemade gift ideas for embellishing a store-bought notebook into the unique hand-decorated journal of your choice. Click on the links below for the full tutorials. 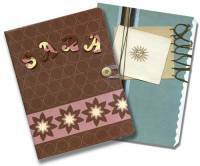 This easy homemade journal utilizes a composition notebook, patterned paper, ribbon, embroidery thread and stamping. 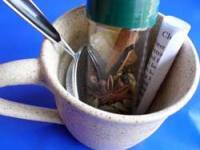 It is extremely easy and inexpensive as well. If you have a notebook and some pretty paper, you can make a journal using these instructions as a guide. Embellish your journal with the materials you have on hand. Here is another easy to make journal. Using similar methods you can use heavy paper and a postcard, card or image of some kind to make a journal with lots of personality. What makes this decorated journal special, is the recycling of an old image that might otherwise not be used again. Whether you use an old drawing, postcard, card or photograph - you'll enjoy finding a new use for it as the centerpiece for your journal gift. Here's a tutorial that teaches you how to make your own book using the most basic Japanese book binding technique I know of. I did this a long time ago and thought it was a lot of fun choosing beautiful cover paper and matching it up with high quality paper for the insides. You could also use this technique with homemade paper for a truly hand made book! If you like working with paper, you might also like this simple decoupage frame. Inspire others!!! ...If you make a journal or a book, be sure and share it in the HMGG photo gallery! This DIY whole spice chai tea mix makes a unique homemade gift idea!